Your skin is the fingerprint of what is going on inside the body, and all skin conditions, from psoriasis to acne to aging, are the manifestations of your body's nutritional deficiencies and needs. There is a lot of new research that shows the power of antioxidants and nutrients that can make a difference in the way your skin looks and feels. Vitamins A, B-complex (especially B7), C, E, and K, all help improve skin health. 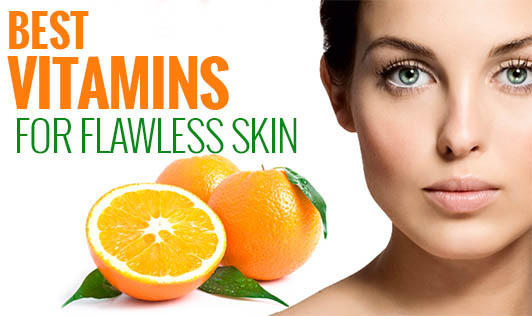 Vitamin A is necessary for the maintenance and repair of skin tissues. Fruits and vegetables are loaded with vitamin A. Medical studies show a reduction in lines and wrinkles, good acne control, and some psoriasis relief, from using creams and adopting diets rich in this nutrient. When it comes to skin, the most important of B vitamins is B7 vitamin ie, BIOTIN a nutrient that forms the basis of skin, nail, and hair cells. Without adequate amounts of this vitamin, you may face problems such as dermatitis (an itchy, scaly skin reaction) or sometimes even hair loss. Even a mild deficiency causes problems. It's found in many foods including bananas, eggs, oatmeal, and rice, plus your body also makes some biotin on its own. Vitamins C and E help by reducing the damage caused by free radicals, a harmful by-product of sunlight, smoke, and pollution. When these two are used in a lotion, they prove to be highly protective against sun damage. Make sure your diet includes plenty of vitamin C. Eat citrus fruits and vegetables such as bell peppers, broccoli, cauliflower, and leafy greens. These foods can help to replace the loss of vitamins. Vitamin E is found in vegetable oils, nuts, seeds, olives, spinach, and asparagus. As the nutrient for blood coagulation, Vitamin K won't do much for your skin from the inside. But, many studies showed that topical vitamin K works well to reduce circles under the eyes as well as bruises. Most people can get all the nutrients their skin needs from a healthy diet. It’s not a matter of spending a lot of money on vitamin supplements or creams. The idea is to use them in a way that's helpful to you. The best approach is to drink plenty of water, use gentle products to cleanse the skin, always wearing a sunscreen, and eating a balanced diet.